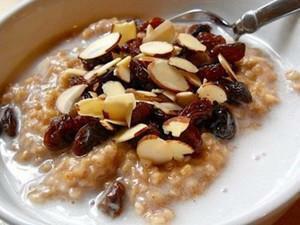 Add the oats, water and raisins together and put in the microwave for 45 seconds. Stir once and then microwave again for 45 seconds. Set it aside for a couple of minutes to absorb more liquid. Then sprinkle with cinnamon and brown sugar. Recipe Author: Eat This Much Inc.